They say not everything natural is good for you. Nature has many poisons that humans have experimented with and learned the hard way to avoid. Tobacco is a popular plant that we’ve learned can really do a number on your health. Using tobacco is a personal and communal practice that can be really hard to avoid, even if you know it’s bad for you. Working with your doctor and dentist will be essential if you’re concerned about your health and want to stop using tobacco. Tobacco is a green, leafy plant that has long been grown, dried, and used by cultures around the world. It’s usually smoked but is sometimes chewed or inhaled. Tobacco is known to affect the way people think, feel, and behave by interrupting your brain’s normal communication with the rest of your body. The tobacco plant contains the addictive stimulant nicotine, which is why a smoking habit is so hard to break. Cigarettes contain 2,000 ingredients known to be toxic and harmful to the human body. There’s nothing good to be said about tobacco use. More than 20 million people have died directly because of tobacco (either personal use or second-hand) since the Surgeon General first put out the warning against it in 1964. It’s especially bad for your heart and lungs. Since all forms of using tobacco first enter through your mouth, you can imagine it also really takes a toll on your oral health. 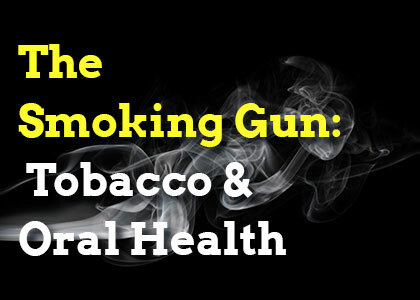 Using tobacco has immediate and long-term consequences on your mouth and body. It’s hard (impossible, actually) to be completely healthy if your mouth isn’t healthy. Your oral health affects your overall health in so many ways, and vice versa—the two go hand-in-hand. Quitting tobacco completely is the only way to avoid the negative side effects associated with smoking, chewing, and snuffing. If you want to take better care of yourself and quit using tobacco, your dentist can be a helpful and supportive partner on the journey. Everyone deserves a life that makes them smile and a smile they are proud to show off. If you’re concerned about your tobacco use, you should come see us for an oral cancer screening today. Dr. Yakowicz is a professional dentist in Belleville at Neighborhood Smiles. Make an appointment today and let us help you make positive changes in your life and smile!